YWCA Greater Cincinnati, our designated pro bono client, just celebrated a rare milestone. 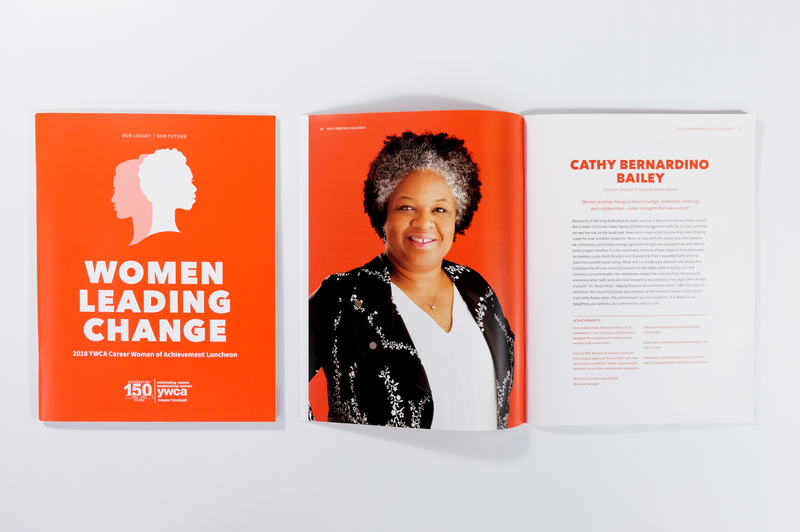 For 150 years, this local icon has been a leader on women’s issues, working across—and through—economic, generational, ethnic and racial differences. As a women-owned business, we embraced the opportunity to help “symbolize” this mission. The annual Career Women of Achievement event would kick off the 150th anniversary tribute. To carry the celebratory message all year long, we created a graphic featuring two silhouettes—one looking back, one looking forward—as a nod to the past and a vision for the future. The symbol quickly became a campaign focal point; Rookwood Pottery even incorporated the design into their annual commemorative holiday ornament. 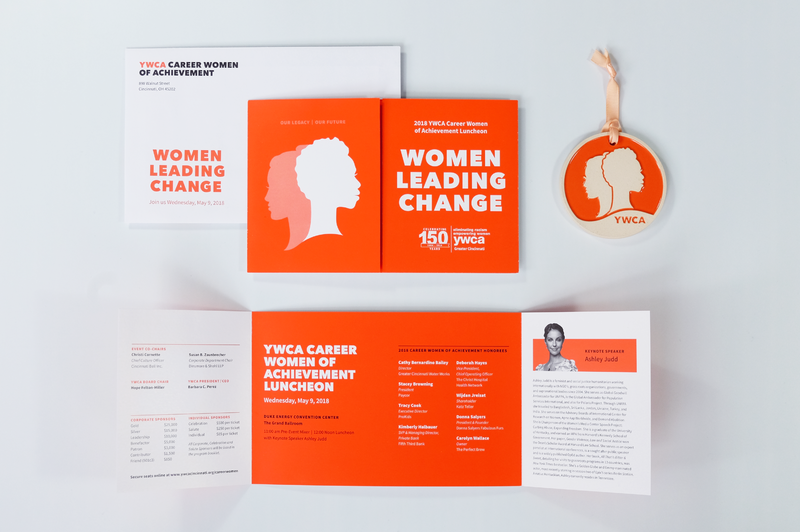 The main theme for the CWA luncheon was “Women Leading Change,” a tribute to the extraordinary women connected with the YWCA throughout its history. Each of the 8 women being honored at the luncheon were profiled, telling the story of their achievements and impact amid a direct, confident design. 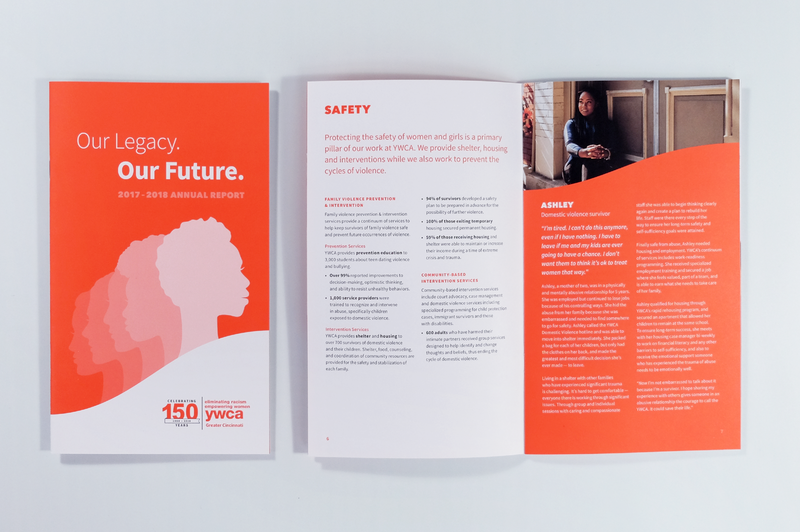 The graphic evolved for the YWCA’s annual report, emphasizing the contributions of the women who came before and built a foundation for future progress. The arrangement of silhouettes creates forward motion throughout the piece—while accomplishing much, the YWCA’s work continues. This is also reflected in the report’s title (“Our Legacy. Our Future.”) and the stories it tells. Interwoven with progress reports and program highlights are personal accounts of recent YWCA clients. Thanks to Katie McCue of Bird and Rose Photography for creating the client portraits.